We can organise various types of expeditions, listed below are several popular options. Please contact us if you would like to discuss other expeditions. We will be very happy to advise you. 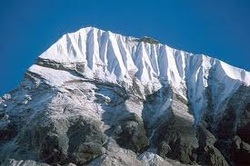 Mera Peak is the highest trekking peak in Nepal. 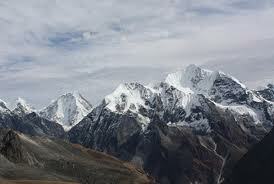 It is situated on the edge of the famous Khumbu Region, which is dominated by Mount Everest. Although very high, Mera is a straightforward climb and is frequently ascended by groups and individuals whose only climbing qualifications are that they are fit and have an out-going sense of adventure.This special expedition to Mera is designed for those who only have three working weeks' holiday time available. The first fourteen days take us south from the airstrip at Lukla, trekking through beautiful forested hillsides and over several passes before climbing up to the Mera La. After the climb, we descend directly to Lukla via the Zatrwa La pass. The Mera Expedition is a high-altitude trek and climb and participants need to be fit and conversant with the use of an ice-axe and crampons. Instruction in the use of these will be given at our base camp near the Mera La if required. In good conditions it is possible for a fit party to reach the summit and return to base camp in one day. It is normal, however, to establish a high-camp at 19,000ft/5,800m on the Mera Glacier, in order to shorten the summit day. This is a rewarding experience as it provides glorious views of Nepal and a vista that takes in Kangchenjunga and Makalu to the east and Everest appearing over the massive southern aspect of Nuptse and Lhotse to the north. To the west stand the spires of Ama Dablam and Kang Taiga and in the distance is the mighty bastion of Cho Oyu. This is a fine panorama of many of the world's highest peaks. The climb itself takes the north face glacier in a steady rise to the summit ridge which leads, in an exposed and exciting situation, to the top. After the mountain has been climbed, we return by a direct route across a dramatic ridge to Lukla and the flight to Kathmandu. Located between the Ama Dablam and Lhotse Mountains chains and on the top of Chhukung Glacier, the most hunted after trekking destination is the Island Peak expedition because it offers an excellent opportunity to achieve a Himalayan Summit of 6173m even without any ideal climbing skills. This wonderful Island Peak expedition takes you into the heart of the mountain, Khumbu region, which offers an unforgettable and magnificent close-up views of Mt. Everest, Lhotse, Nuptse, Makalu and many more. Island peak was renamed "Imje Tse" in the early '80s, though its original name is still more popular. The mountain was named "Island Peak" in 1952 AD due to its striking location in the middle of the Chhukung valley, like an island on a sea of ice. Island Peak has an impressive highly glaciated west face that rises from the Lhotse Glacier which is a bit tough to do, however the magnificent views from the summit are certainly a fitting reward for our efforts. Pisang Peak is the most popular Peak among the trekking peaks in Annapurna region of Nepal. It is on the way to the highest pass of the world and offers good scope for exploration. The western flank of the mountain is guarded by a hanging glacier and offers considerable challenge. The western end of the ridge has huge rock slabs, which make it difficult to climb. A German Expedition made the first ascent of Pisang Peak in 1955 and since then it has been something of considerable remark. Trekkers with little experience in climbing can combine the popular classic Annapurna circuit trek with Pisang Peak climbing to have the taste of climbing in Himalayas in Nepal. The peak rises above from Pisang village and yak pastures in a uniform slope of ice and snow to the final summit pyramid. 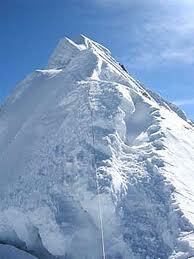 Pisang peak is considered one of the technical climbing peaks among of the climbing peaks in Nepal. Firstly, we departure to Besisahar from Katmandu and start trek enroute common Annapurna Circuit trails and reach Pisang in a 5 days. To reach the base camp from Pisang village, the path ascends through sparse wood and pasture to a Kharka at (4,380m) which is considered the best place for setting up the base camp. High Camp is set up at (5,400m) climbing to a shoulder on the South-West Ridge. There will be snow at the high camp from the end of November to the end of March. The well defined ridge leads to the final snow slop which is quite steep and little difficult to reach the summit. Summit of the peak offers truly splendid views of the Annapurna group including Tilicho Peak, Annapurna II and IV, Ghangapurna and the Glacier Dome. Pisang Peak is indeed a "sightseeing peak. Descent is made on the same route. After a successful summit, we continue our trek to Manang valley and continue further up to Thorong Pedi. We will cross a highest pass of the world, Thorong pass at early morning and will arrive Muktinath, another part of the Annapurna. We descend further down through scenic Jharkot village, Kagbeni, a gate way to Upper Mustang and reach jomsom, a capital of Mustang where a small airstrip has on the bank of Kaligandaki River from where we take an early morning flight back to Pokhara and the trip ends. Naya kanga Peak climbing 5855m/19,160ft is one of the most interesting peak climbing adventures in Nepal accessible to wide range of climbers. Naya Kanga Peak situated in the southern flank of Langtang and towering over the south of alpine Langtang valley and holy lakes of Gosaikunda is one the more interesting and spectacular climbing peaksfor peak climbing in Nepal for moderate climber or fit adventurous trekker looking to extend his trekking skills to scrambling and climbing and to experience stunning guided climb and to develop basic climbing skills in a supportive and safe environment. 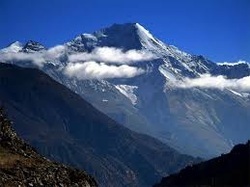 Naya Kanga Peak closeness to Kathmandu and relative remoteness of stunning area increasingly visited by more and more trekkers offers intermediate climbers or adventurous trekkers looking of first Himalayan climb an extend trekking adventure of 5500m+ climb. Tent Peak, also known as the Tharpu Chuli. Lying just south of the Annapurna Base Camp, the Tharpu Chuli (5663m/18,575 ft) or Tent Peak summit offers magnificent panoramic views of majestic snow-capped mountains of the Annapurna region. The beautiful landscape at the trekking part adds another reason for choosing a climb to this spectacular Tent Peak. While you trek along the fertile Modi Khola River belt, you will experience the natural grandeur as well as the cultural magnificence of most popular trekking region of Nepal. The alpine plants, lush forests, colorful flowers of lush forests, culturally rich local people, snow covered mountains would surely mesmerize you with their serene beauty. Path to the beginning of the route runs along a steep serpentine road with amazingly beautiful scenery. During the spring season, you will see the mountains tinged with red or pink. As you trek higher, you will experience why the buffer zone near the Annapurna massif is considered the most picturesque in Nepal. Moreover, the easy accessibility of the Tent Peak makes it an ideal destination for those wishing for a short trekking plus peak climbing expedition. The Tent Peak or Tharpu Chuli Climbing trek commences from the Lake City of Pokhara in the Annapurna region. During the initial days, while trekking via Dhampus, Landruk, Chomrong and Dobhan, enjoy the mountainous environment marveling at colorful flora and clear views of the splendid high mountains including the two eight-thousanders: Mt. Annapurna (8091 m) and Mt. 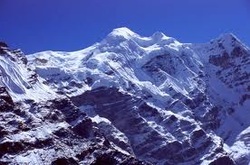 Dhaulagiri (8167m). Enjoy the ethnic hospitality along with the cultural magnificence of Nepal's ethnic mountain people. Trekking further we reach MBC and ABC. The climb for Tent Peak or Tharpu Chuli starts further from ABC after reaching the Tent Peak Base Camp. After summiting the peak, return the same route until ABC. From ABC, we trek down to Bamboo, Jhinudada, and Nayapul, passing by waterfalls, villages & settlements, and the rhododendron forest that bloom with red flowers during the springtime. From Naya Pul, we drive to Pokhara which announces the end of this marvelous adventure.